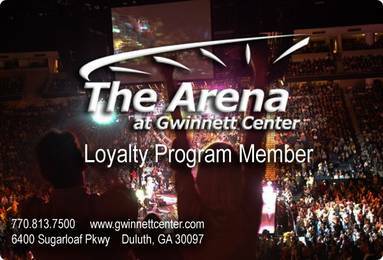 The Arena at Gwinnett Center Loyalty Program is offered to all of our Premium Club Members. Catch the excitement and discover the special offers in our area! All you need to do is present your Loyalty Program Card to the merchant to receive your discount. Biltmore: $15 off the gate price; members must log onto web site, www.biltmore.com/gwinnett, to purchase discounted tickets or show a card identifying them as a Loyalty Program Member at the group sales office. Medieval Times Dinner and Tournament: All seats $32.95 with code 32GR; upgrades, applicable fees, tax and gratuity are additional. Must order tickets through website. Underground Atlanta: $1.00 off "From Civil War to Civil Rights" Guided History Tour. To book a tour call 404-523-2311 x 7019 or www.underground-atlanta.com. The Spa at Chateau Elan: 20% off any 50 minute or more a la carte spa service, VALID Monday-Thursday ONLY. Frontera Mex Mex Grill: 10% off food only, promotion valid for card holder ONLY. Luciano's Ristorante Italiano: 10% off food only, promotion valid ONLY for card holder. Down to Earth Companies, Atlanta LLC: 1 month free lawn care with yearly contract. Don’t miss out on existing amenities! All the above as well as a great deal more!